Who doesn’t love seeing those beautiful butterflies and hummingbirds flying and zipping around in our backyard garden? They are such a lovely sight to see and if at all possible it is something that we want to enjoy as long as possible. It actually is pretty easy to keep butterflies and hummingbirds around longer if you know what attracts them there in the first place. The main ingredients for this are nectar producing flowers, host plants, water, and shelter. 1. 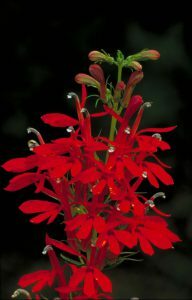 Cardinal Flower – A perennial flower and a definite must have in any garden with its tall vivid red flower spikes. They like a moist soil and will bloom from May through October. 2. 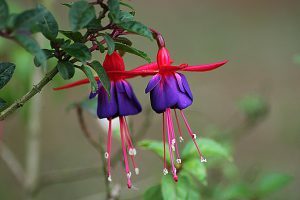 Fuchsia – This is considered a tender perennial meaning they are hardy in warmer climates but will die off in winter in colder climates. They are easy to grow if you keep them in a light cool spot shielded by the hot sun. 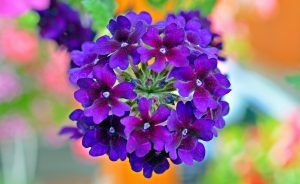 They require regular watering and will keep blooming throughout the summer months. 3. 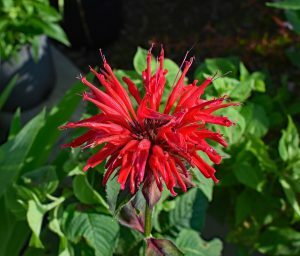 Bee Balm – A perennial flower that reminds me of fireworks with its open spike-like petals. This beautiful flower comes in shades of red, pink, purple and white. They prefer moist, rich soil in a sunny location. It has a long bloom time in both summer and fall. 4. Petunias – A popular annual in many gardens that are great in containers or gardens. 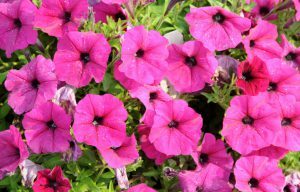 Petunias have large flowers and come in many different shades and like full sun. 5. Verbena – A tender perennial that is drought resistant and loves the sun. It is a continuous bloomer that comes in shades of blue, pink, purple, red, and white. 6. 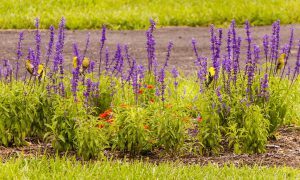 Salvia – This is a tender perennial that blooms profusely all summer long. It likes hot, dry conditions and comes in shades of purple, blue, red, and pink. Very easy to grow. If you look closely at this picture you will see goldfinches clinging on the flowers. They love this plant too which is an added bonus. 7. 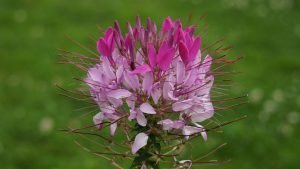 Cleome – An annual flower that re-seeds itself and returns year after year. All it needs is well-drained soil and it will bloom from summer to first frost. They hold up very well in the scorching heat too. 8. 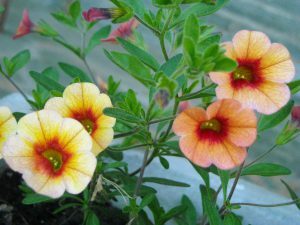 Calibrachoa – Also called Superbells or Millionbells and for a reason. This flower gets hundreds of small bell-like trailing flowers that look like miniature petunias. They prefer well-drained soil in full sun and are great in planters. Superbells come in a variety of colors and are lovely in any garden. These are my must-have every summer. 9. Cosmos Flower – An annual flower that blooms throughout the summer months. They come in shades of orange, pink, and white. 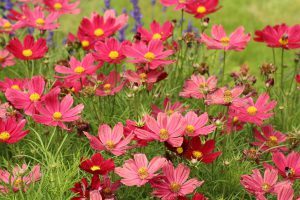 Cosmos are easy to grow from seed and do well even in poor soil. They love the full sun and are great in gardens or in containers. 10. 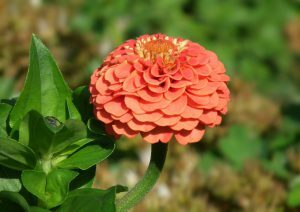 Zinnia – An annual flower that is very easy to grow. They come in bright colors like pink, purple, orange, and red. Zinnias thrive during the long hot summers and like full sun. If you want butterflies to stick around you will want to have host plants for them. These plants are important to provide for butterflies so that they will be able to lay their eggs on them. They are also an essential food source for the emerging caterpillar. Not all butterflies like the same host plant either. For example, the Monarch Butterfly prefers milkweed and the Anise and Black Swallowtail like dill, parsley, fennel, Queen Anne’s lace, and carrot. The Painted Lady Butterfly likes thistle, hollyhock, and sunflowers and the Red-spotted Purple likes wild cherry, oak, poplar, hawthorn, and willow. Host plants aren’t a must have just something to consider if you want to attract more butterflies. Butterflies and hummingbirds do get moisture from the nectar of plants but they still need water. For butterflies it is so they can get the needed minerals and nutrients that helps them to fly and to reproduce. Butterflies do what is called puddling which means that they like to sip at shallow puddles of water in mud or sand. 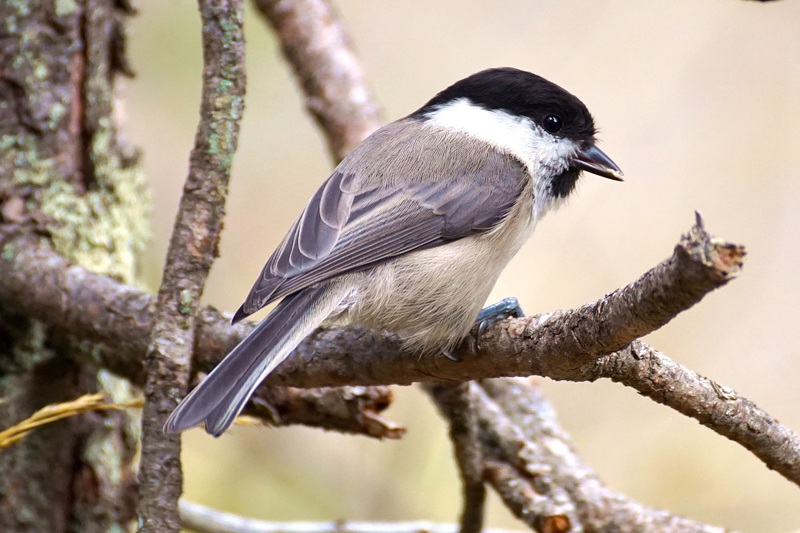 Larger open water areas such as a birdbath will overwhelm them. You can make your own puddler by taking a shallow dish such as terracotta plant saucer or pie tin and putting about three quarters of sand or gravel in it. Put enough water in it to wet it down and place in your sunny garden. Sprinkle with salt every so often which butterflies need. Just remember to keep it moist during the hot summer. Butterflies will love it! Hummingbirds need water to drink and to bathe and really prefer a fine mist over a bird bath. We have a mister that is placed in a tree near our deck which the hummingbirds love to zip through. Many other birds like it too for coming in to preen their feathers and to keep cool. Both hummingbirds and butterflies need shelter from predators and from the elements. For hummingbirds shrubs and bushes work well so that they can retreat to them when the weather turns bad and also to escape from danger. Butterflies may cling to the undersides of leaves, crawl under rocks, or sit deep inside tall grasses with their wings held tight. 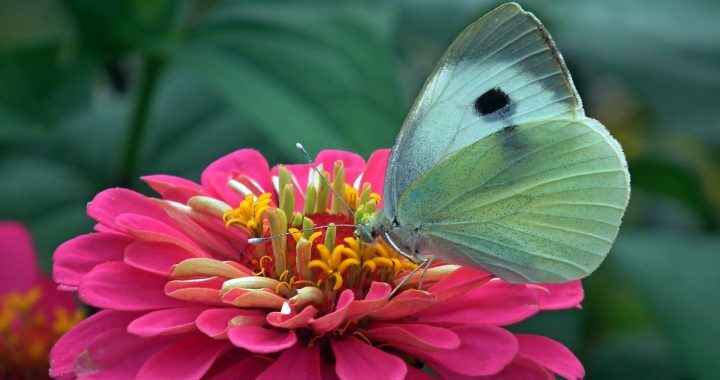 It is not too difficult to attract butterflies and hummingbirds to your garden if you have the right nectar producing flowers such as petunias, cleome, bee balm, cardinal flowers, zinnias, million bells, and cosmos. These are all mostly sun loving plants and would be a beautiful addition to any backyard. They are not the only flowers that you can plant just some favorites of mine. If you want to try something different then ask your local gardener what other flowers will work. You can also provide host plants for the butterflies such as fennel, milkweed, sunflowers, thistle, and hollyhock which will keep the butterflies around even longer. It is not necessary but just another thing to consider. A good water source is a definite must as both hummingbirds and butterflies require it for survival just like all other creatures. Also add some shelter such as shrubs and bushes for protecting these beautiful creatures from predators and from the weather. If you provide these necessary things in your backyard garden, I guarantee that you will have hummingbirds and beautiful butterflies to enjoy all season long. Posted in Attract Butterflies, Hummingbirds, In The Garden, Uncategorized and tagged butterflies, hummingbirds. ← Water IS For The Birds!